As August, draws to a close, I’d be remiss if I didn’t share something acknowledging National Water Quality Month. Of course, providing our customers with quality water is a year-round 24/7 focus for us…but National Water Quality Month is an opportunity to give the quality water mission a little extra boost by reminding everyone how they can be advocates for quality water year-round. 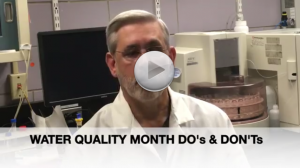 I hope you enjoy my video below, including some easy Do’s and Don’ts that will help spread the efforts and spirit of Water Quality Month further. Lots of good tips in this Vlog!